BODY: Solitary, flattened globose to globose, to 60-90 mm in diameter and 40-80 mm high, stems greyish green, sunken apex covered with wool and spines. TUBERCLES: Medium set, four angled pyramidal, 10 -12 mm long and 7 - 9 mm thick. RADIAL SPINES: 4 - 7, horizontal radiating, glassy white to brown with darker tips, bristle like, straight or curving, irregular radiating, the uppermost the shortest, to 2 - 6 mm long. CENTRAL SPINES: 2 - 4, needle like, the lowest the longest, straight, thicker at base, glassy yellow to brown with darker tips, 4 - 25 mm long. FRUIT: Pinkish to whitish green, club-shaped, 20 - 30 mm long and 4 - 7 mm wide. Ripens somewhat 5 months after flowering. SEED: Brown, drop to kidney shaped, 1 mm long and 0,8 mm in diameter. Hilum: small, white and subbasal. Selfsterile. HABITAT SUBSTRATE: Between volcanic rocks, in cracks filled with humus. GEOGRAPHICAL DISTRIBUTION: Mexico, San Luis Potosi near Teposan/Santa Maria del Rio. Altitude: 2000 m.
COMMENTS: Lumped by Hunt under Gigantea and by Mottram under ocotilllensis. These two species (gigantea and ocotillensis) are not growing in the neighbourhood of saint-pieana. 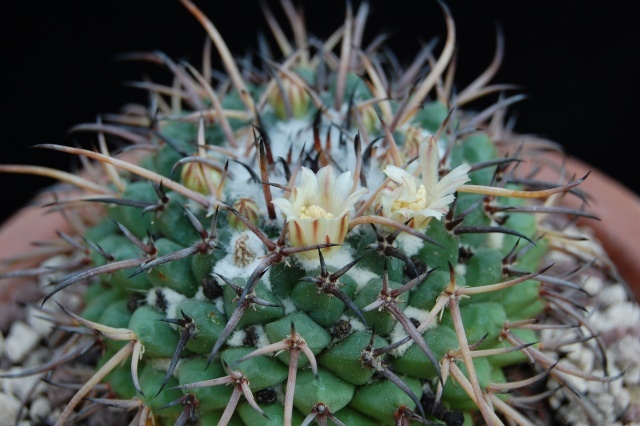 BIBLIOGRAPHY: Reppenhagen, Die Gattung Mammillaria 257 (1989).